What Is Child Swap or Rider Switch and How Does It Work? If guests in your party don’t want to board an attraction, you don’t have to miss out. One adult can wait with the non-rider while the rest of the party experiences the attraction. The waiting adult can then board the attraction without having to wait in the regular line again when another adult in the party returns to supervise the child or children who do not ride—either because they do not meet the height requirement or simply do not wish to ride. It can also be used by those with a group that has a person who is incapable of riding due to disability, regardless of age. How many guests are allowed to use Rider Switch / Child Swap? 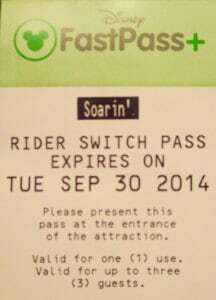 The Rider Switch / Child Swap pass allows up to 3 people to board the attraction using a single return pass. As you approach the stand by queue or Fastpass+ return, ask the Cast Member for a Child Swap or Rider Switch pass. One adult will be asked to remain with the non rider while the other adult and children are allowed to board the attraction. You can either ride a nearby attraction or sit out nearby. After riding the ride, the adult who rode will now “switch” with the other adult who was waiting with the non-rider. The previously non-riding adult takes the special paper pass to the Fastpass+ return, presents it to the Cast Member and 2 children are now allowed to ride with them. This allows two children to ride two different times, once with each adult. Which attractions provide Rider Switch / Child Swap? Rider Switch is available at select attractions at all Four Walt Disney World theme parks. Other attractions may offer these passes, check with the Cast Member at the attraction. For how long is the Rider Switch / Child Swap pass valid? The paper pass is valid for the entire day and is stamped with the date prominently on the ticket. (I’ve been informed by readers that some attractions are providing return passes that are valid for several weeks). What does Rider Switch / Child Swap cost? It’s a free service to help with adults who have guests in their party who do not wish to ride or are incapable of riding. Can I use Rider Switch / Child Swap in conjunction with Fastpass+? Yes, you may use these services together. Book a Fastpass+ for one adult that plans to ride first and any children that plan to ride. Hi, can you please advise if anything has changed since going electronic ? Will the second group need a fast pass or are they able to go to the fast pass line? No, the second group just needs the rider switch pass and not a fast pass, but they will get to use the fast pass line. Hi Kenny, has this all changed since it went electronic? We have dad, mom, 8 yo, and 1 yo and don’t know if we all need FPP on the same ride at the same time to utilize. Thanks!! When we use child swap, will we be able to immediately board the attraction or do we have to wait in line? Can my husband use single rider line AND get a child swap ticket for me? Could my son ride the ride while I wait for him using the child swap. Mom, Dad, 4 Year Old Boy 2 Yr Old Boy. All 4 have FP. Family gets to ride 2 rides only using 1 FP each? Hey, on the Disney site it says that Frozen Ever After can be done with Rider Switch? Really? Has anyone done this? Kenny, curious, we are traveling to MK in Sept, is Rider Switch still available at 7 Dwarfs? I will be traveling with a 1 year old who will not be able to ride. Thanks. Hi Kenny, We are going to DW early May and have a FP for Seven Dwarfs. We have 2 adults and a toddler. Would we be able to us his FP and do CS & then use my FP and do CS? or would it take both of our FP’s? Yes one adult can Fastpass and the other can use the Child Swap pass. We are headed to the World In October. my family will be traveling with my sister in law and her family. My family of four can ride with no issues, however my sister in law will have her husband and their three kids. One will be able to ride but the 2 year old TWINS wont ride much. Can we utilize the rider swap to allow my family to ride first while hers waits with the twins and then we wait with the twins while her, her husband and the older child ride(this is their first experience going with their kids and want to do the rides as a family)? Could one of my kids potentially ride again with them as well? This is our first time doing the rider swap and I hear conflicting stories of how many can wait and cannot wait. Thanks! We will ride then wait with the twins and then they can ride and we will watch the twins! Thanks!!! I thought that all members of a group had to all have FP+ booked for a ride. Is it possible to book only 1 FP+ member of the group for a tier 1 and then another member of the group for a different Tier 1 ride? If I have 2 adults and 2 children, one age 4 and one non-riding age 1.5, and I’m trying to maximize the FP+ using the Rider Switch, does that work? Meaning, wouldn’t the 4 year old need to have a FP+ for all of the rides? Dad gets FP for 3 rides that do Rider Switch. Mom gets FP for 3 other separate rides that do Rider Switch. Doesn’t the 4 year old need to have a FP for all 6 of the rides (which obviously can’t happen since he’s only allowed up to 3 FPs initially) to be able to ride with the adult the first time (and then ride the second time under the rider switch)? Or does only 1 member of the family need to have a FP for a ride for the rest of the family to be able to get a rider switch pass? I will get 1 FP+ for a height restricted ride, say, Space Mtn for my husband, he rides, I get Rider Swap pass? Or do we both need FP+ for Space? 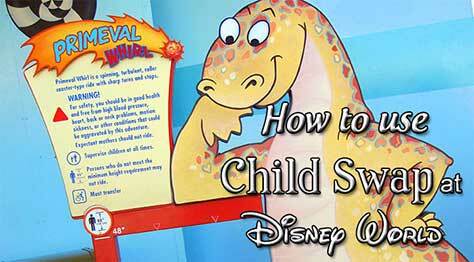 Should but Disney could enforce the FP rule and make you both tap before giving out the Child Swap pass. I emailed Disney because it is really going to affect my planning and I know that maybe we can take it or leave it but this was the response. Maybe they are changing it in the future??? We’re glad you and your family are going to be visiting us! Only 2 Guests are allowed per Rider Switch Pass. I do apologize for any inconvenience. We hope you and your family have a terrific visit to Walt Disney World! PLEASE NOTE: All information is subject to change without notice and should be confirmed just prior to your visit. I’ll check this on the weekend. Kenny, I know that rider swap has always allowed 3 riders but I am getting nervous because this is the quote on Disney’s site, “If the person in Party 2 waited alone with the child, he or she may bring one Guest back to ride the attraction with him or her. Please note: Only 2 Guests are allowed per Rider Switch Pass.” Has it changed? Is it changing??? Banking on the 3 riders for our trip in Sept.
Hi Kenny for the adult not riding can they go back with another adult using the Rider switch pass? We have a large family going 6 adults and 5 kids, if none of the kids want to ride again can an adult or 2 adults go so Rider left behind doesn’t have to go by themselves? Thanks so much!! The switch pass allows 3 riders regardless of age. HI Kenny! I just want to be clear on this. It’s our first time using the Rider Swap option. We are a party of Dad, Mom, Grandma, Kid1 (11yo), and Kid2 (2 yo). It is my understanding we book a FP for Grandma, Mom and Kid1. Kid2 stays behind with Dad. Dad can then switch with Mom and Kid1 gets to ride again? you can use your child’s fast pass and they wont check the 3 year olds. I have done it plenty of times. We are a family of 4 (2 Adults, a 5 yr old and a 2 yr old). We currenly have FP+ for the Mine Train, Splash Mtn, and Big Thunder for both adults and the 5 yr old. If I am understanding correctly I could change those 3 FP+ to just a single FP+ for myself, then get a switch pass that both my wife and 5yr old could use (without wasting one of their FP+ rides)? Then those two could choose 3 additional FP+ rides? My travel agent says when they went this past february that it works on some rides but on space mountain, all must go through the fast pass line (and have fastpasses to be be able to do it) and then the child swap is right next to the ride but all the party must have fast passes to be able to use the child swap. She said on other rides, they wouldn’t do child swap using fast pass unless all members scanned and had the fastpass. I sure don’t want to miss riding the coasters if i don’t get fast passes for myself thinking i am going to do the child swap. Has anyone used the fast pass to do child swap or did some of the cast members give you trouble? Your TA is wrong. Space Mtn works just like the rest. You get a ticket a FP return. FP scanning for entire group can happen when you have a new Cast Member, but not very often. Can you tell me if I understand this properly? (all because we have a 4th, non-riding, baby). Not getting all the 3rd and 4th rides. This is marvelous! First time that I’m reading about this! We are 2 adults and 2 children (11, 4) visiting in august/September 2015. My 4 year old is tall for her age (already 42″), however, I think that she might get scared or decide not to go for the coaster rides which would be otherwise fine given her height! So, can I book a FP+ for just my husband and son? Then all 4 of us get into the FP+ line and request a Rider switch for me (and may be my son, in case he wants to go again)? That way I don’t need to waste the FP for me and daughter, which I can use for princess meet and greet instead. Thanks for your time and assistance in advance. Acquire FP for the group riding first. Show up at FP line and get rider switch pass. 2nd group of up to 3 uses Rider Switch pass. Thanks for your prompt response, much appreciated. Why would it matter if they had similar names? You don’t get carded when you enter a FP line. Person’s name appears on the screen at the check point. Boy name vs girl name might appear pretty obvious. I was thinking the same way you can double you fast passes if the swap is used separate. Oh ok, so I understand that magicbands are not interchangeable then? X cannot go in Y’s place for a fastpass+ reservation? I won’t say that, I’ll just say that the person’s name appears on the CM screen and let you go from there. Can we put one (1) FP+ for 3 different rides in order to be able to use Child Swap for 3 different rides? 3. Child has FP+ for Big Thunder. However in that 3rd case, Dad uses Child’s magicband to go first, then Mom & Child use Child Swap. Can that be done..? Or does a Child’s magicband ‘beep’ differently than an adult’s magicband when entering the ride line? Confused by the third FP. You’re going to have dad use child’s MagicBand? I assume Dad and child have similar names? No, they don’t beep any differently. Sorry follow up am I wasting a fast pass booking myself for the same time as my 4 yr old? Yes, there is no “depends.” Disney phone agents don’t know what they are talking about. Wife uses FP+ and you use the Child Swap pass and can take a maximum of 3 people through the line with it. sorry kenny…i didn’t read the entire above…i see that lady was wrong. doesn’t matter if my son is scared we can still do rider swap. got it. I’m curious of this answer. I thought the whole point was to let my hubby and I ride it so that one can stay behind with the one that is scared (even if he meets requirements) and so we don’t have to wait in line twice. No, one parent or guardian must remain with the non-rider at all times. The times are shortened using Child Swap by using the Fastpass line for access. What age would be considered an adult? I have 2 kids and one doesn’t like much of the rides. 11 and 9 are there ages? 10 years old for ticket prices, but if a 9 or 11 don’t want to ride, you might still get rider switch. Got you! I think I was thinking too hard about it! Thanks! We will have 4 adults and 1 child (3), does the rider switch of up to 3 include adults or only children? I thought maybe two could ride and two could wait and then switch. id hate to have one person ride solo each time. I can be used by anyone. Just need one adult to stay behind with the child each time. Thanks for the great info! Is it possible to rider switch from Mission SPACE orange and my husband to go on Mission SPACE green. My situation is that I have two daughters who like all the fast rides but my wife is the one who doesn’t like them. My daughters (ages 6 and 8) are too young to ride by themselves so I’d like to be able to switch and ride with each of them while my wife sits out the rides. Can adults switch or is it only for kids? Any thoughts on how to handle our situation? Thanks! You just book FP+ for yourself and the kids and don’t bother booking one for the adult. You won’t need Child Swap. Kenny you are so smart. I never thought to book just one adult for a fastpass when using rider swap. I did have an issue using rider swap at 7 dwarfs mine. My 4 year old is tall enough but was scared to ride and the castmember told me I could only use rider swap if she did not meet the requirements. So might depend on who you get and how well trained they are but I had always been told you could use it if they did not want to ride. Thanks. This is a nice way for get 2 tier 1 fast passes and our return ticket was good for a week. You can also get a rider switch at 7 dwarfs I just got one back in December because my 4 year old was to scared to go on. Just wanted to add that 7Dwarfs also has rider swap.